The inaugural Chicago Wurst Festival, a three-day event celebrating sausage, beer and music, takes place September 18-20 at Daley Plaza. The Wurst Festival highlights artisan sausages utilizing meat from sustainable, natural farming practices. September 18, 19 and 20 from 10 a.m. – 8 p.m. Opening Ceremonies @ 12 p.m.
Sausage Making Demo @ 1 p.m.
“Sausage Mania” Chef Demo @ 3 p.m.
Scott Lucas & The Married Men @ 6 p.m. – 7 p.m.
“Sauerkraut – The Secret Sauce” Chef Demo @ 9:30 a.m.
Gourmet Sausage for Dinner Chef Demo @ 10:30 a.m.
Music by Lawrence Peters Outfit @ 12 p.m. – 1 p.m.
Sausage/Butcher Demo @ 3 p.m.
Beer pairing Mit Sausage @ 4 p.m.
Music by Mazes @ 5 p.m. – 6 p.m.
Music by Chicago Afrobeat Project 6 p.m. – 7 p.m.
100 Ways to Cook Sausage Before Lunch Chef Demo @ 10:30 a.m.
Music by Opposition Party @ 12 p.m. – 1 p.m.
Battle of the Marching Bands @ 1p.m. – 3 p.m.
Sausage/Butcher Demo @ 4 p.m.
Music by DJ Madrid w/ Kat V Electric Violinist @ 5 p.m. – 7 p.m. The three-day event is presented by The City of Chicago’s Farmers Market Program along with Red Meat Market and Family Farmed. 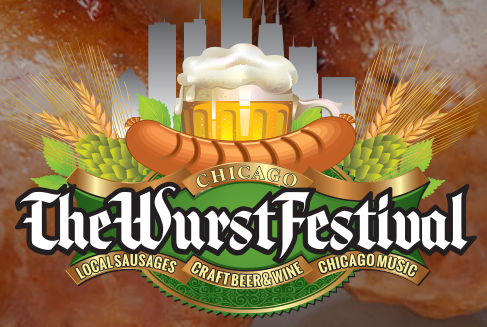 For more information, visit the official Wurst Festival website.